Enroll your child in the Exceptional Family Member Program (EFMP) at one of the local offices. Enroll your child in the Extended Health Care Option (ECHO) program. (It used to be called the Program for Persons with Disabilities (PFPWD)). Note that certain sections of the form must be completed by your physician and by a public official in your county. This program is not available to families of retirees.Congress created the ECHO program to make services accessible to active duty service members in a state other than where they were first granted (because they are required to move frequently and are normally not in one area long enough to become eligible for services through Medicaid waivers). 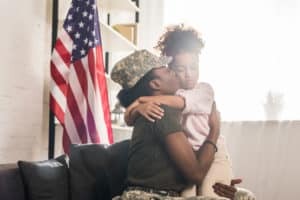 Some services are only accessible through Tricare’s ECHO program and not through Tricare Standard, most notably Applied Behavior Analysis (ABA) therapy. However, most services (such as OT, PT and S&L) are only available through the regular, basic program. There is a monthly co-pay depending on the sponsor’s rank. The program provides up to $2500 of services per month for each family member enrolled in ECHO. Applied Behavior Analysis (ABA) therapy is a structured one-on-one program to identify and address problem areas specific to each autistic child; it is currently approved through ECHO. When this program changed from the PFPWD to ECHO, the criteria to get ABA changed; they are listed in sections 2.2 through 2.4 of chapter 9 of the Tricare Policy Manual 6010.54-M, dated 1 AUG 02. Most autistic children qualify for services under “Significant Physical Disabilities” at section 2.3 by having problems with “unaided performance” with cognition and age-appropriate abilities. Potential qualifying conditions are listed in this section. Some Tricare personnel might insist that the child also have a mental retardation (MR) diagnosis, but that is incorrect. Tricare will not approve ABA therapy for what are viewed as educational issues, only for behavioral or medical problems, which is why you must also have your school system or county health agency complete the Public Use Certification Form provided by your case manager. A home ABA program is possible if the local school system policy is to “only provide ABA for educational purposes”. The Tricare CPT code to be used for ABA therapy is 99199 . A list of certified providers is on the certificant registry. When in doubt, submit a claim to Tricare for anything that you think might qualify. If denied, appeal right away using the info from their denial letter and the justification from the Tricare policy manual. Once enrolled in ECHO for any service you are eligible for 16 hours a month of respite care by a Tricare-authorized Home Health Care provider. This is only for your disabled child; they do not watch your other children, unless you can work out something with the care provider on the side. You will need to have a new request from an MD for this “non-skilled nursing” entitlement. The respite care provider must be a Tricare-authorized “home health care agency” provider, so you cannot use a neighbor, family member, or your regular babysitter. Under “specialty” go to “home health care agency” on your Tricare web site. Hit search, and go to the provider tab to find a Tricare-authorized “home health care agency” provider in your area. Then, make a phone call to them in order to verify that they do accept– and bill– Tricare and that they have non-skilled nursing providers (certified nursing assistants, usually), before you decide which provider would be the best fit for your family. The request should state something like “non-skilled respite care by ‘provider’s name and address’ for up to 16 hours/ month X 12 months.” The request can and should be for 12 months at a time, even though Tricare can only do the authorizations for 6 months at a time. You can only use this benefit if you have money left from your $2500. If you use your full $2500 on ABA, you cannot also receive respite hours. You may request a referral through your military pediatrician to see an integrative doctor. You may request an “autism specialist to medically evaluate and treat autism” under section 3.10 on treatment of mental disorders, chapter 7 of the Tricare Policy Manual 6010.54-M, dated 1 AUG 02. You can try to find an integrative doctor in your area by asking parents in support groups. Tricare will only pay for an MD. It is good to have the specific integrative doctor listed on the referral, since that makes the authorization process go a lot faster. Under Tricare Standard you do not need a referral to see an integrative doctor. With Standard you are responsible for the first $350, then Standard pays 80% of the allowable amount up to $1000. After $1000 they pay the full allowable amount. Integrative doctors are not likely to be contracted through Tricare; their rates will be much higher than the Tricare allowable amount. For example, if your doctor charges $400/hour and Tricare allows $150, Tricare will pay 80% of $150 ($120), you will be responsible for the remaining $280 until you have paid $1000 out-of-pocket. Purchasing a Tricare supplement when using Standard can be a wise investment. Do a Google search for “Tricare supplement” and consider the available plans. They are often listed in the back of the military “Times” newspapers. Nutritional supplements are covered by Tricare if they are given only by tube, are ordered by an MD, are a pharmacy-filled prescription, and are the child’s primary source of nutrition. Any military pediatrician can order tests for kids with autism from outside labs, but the military lab will probably insist that they can do the same tests for free and just as well– not quite true. Many labs are Tricare-authorized. You can get these tests done without any payment from you at all, or you can prepay at a lower rate. Verify with Tricare Claims Department that they will pay for these tests before you take the samples and send them to the lab, just to be sure. You or your doctor order the appropriate test kits from the lab using their website, or by phone. Have a doctor sign off on the test request form, and then send the sample to the lab using the express package service provided. The doctor will need to put the lab request in electronically to Tricare through the military referral system (for Prime only) and list the specific test (and the non-network lab if that’s what is to be used). A military lab will draw and process a blood sample if it is necessary and if you have a valid test request form. Then, complete the form for an insurance payment, which you will have to back up with your credit card number in case Tricare does not pay. Be sure to note that you want a copy of the test results sent directly to you when you send in the test kit and form, as well as results sent to the doctor.